The hyperpolarization-activated cation current (Ih) plays an important role in regulating neuronal excitability, yet its native single-channel properties in the brain are essentially unknown. Here we use variance-mean analysis to study the properties of single Ih channels in the apical dendrites of cortical layer 5 pyramidal neurons in vitro. In these neurons, we find that Ih channels have an average unitary conductance of 680 ± 30 fS (n = 18). Spectral analysis of simulated and native Ih channels showed that there is little or no channel flicker below 5 kHz. In contrast to the uniformly distributed single-channel conductance, Ih channel number increases exponentially with distance, reaching densities as high as ∼550 channels/μm2 at distal dendritic sites. These high channel densities generate significant membrane voltage noise. By incorporating a stochastic model of Ih single-channel gating into a morphologically realistic model of a layer 5 neuron, we show that this channel noise is higher in distal dendritic compartments and increased threefold with a 10-fold increased single-channel conductance (6.8 pS) but constant Ih current density. In addition, we demonstrate that voltage fluctuations attributable to stochastic Ih channel gating impact on action potential output, with greater spike-timing precision in models with the experimentally determined single-channel conductance. These data suggest that, in the face of high current densities, the small single-channel conductance of Ih is critical for maintaining the fidelity of action potential output. Nonselective hyperpolarization-activated currents in the heart (If) (Brown et al., 1979) and brain (Ih) (Halliwell and Adams, 1982) are crucial for a wide range of physiological processes, including rhythmogenesis, dendritic excitability, and synaptic transmission (Santoro and Tibbs, 1999; Robinson and Siegelbaum, 2003). These diverse functional roles are dependent, in part, on the elementary single-channel properties underlying If and Ih. At the molecular level, If and Ih are encoded by four distinct channel isoforms, called hyperpolarization-activated cyclic nucleotide-gated channels (HCN1–HCN4) (Ludwig et al., 1998; Santoro et al., 1998; Biel et al., 2002), each consisting of six membrane-spanning domains centered around a pore with a C terminus containing a cyclic nucleotide binding site (Santoro and Tibbs, 1999; Wainger et al., 2001; Zagotta et al., 2003). Whereas the first single-channel recordings of If in dissociated cardiac cells indicated a small unitary conductance of 0.98 pS (DiFrancesco, 1986), recent recordings of Ih in acutely dissociated CA1 neurons reported a 10-fold larger single-channel conductance of 10 pS (Simeone et al., 2005). Conflicting observations of HCN single-channel conductance have also been reported for heterologously expressed HCN subunits, with values of the HCN2 unitary conductance ranging from 2.5 pS (Johnson and Zagotta, 2005) to ∼35 pS (Michels et al., 2005). In this study, we aimed to resolve the unitary properties of single Ih channels in the brain in intact preparations (brain slices) using nonstationary fluctuation analysis (NSFA) (Sigworth, 1980) of macroscopic Ih currents recorded in cell-attached patches from the dendrites of cortical layer 5 pyramidal neurons. In these neurons, Ih is nonuniformly distributed with a significantly higher current density in the distal apical dendrites (Stuart and Spruston, 1998; Williams and Stuart, 2000; Berger et al., 2001; Lorincz et al., 2002; Notomi and Shigemoto, 2004), where it acts to shorten the duration of local dendritic postsynaptic events, diminishing distance-dependent effects on somatic EPSP and IPSP time course as well as temporal summation (Magee, 1998; Stuart and Spruston, 1998; Williams and Stuart, 2000, 2003; Berger et al., 2001). Our observations indicate that Ih channels have a small unitary conductance of ∼0.68 pS, which is uniform along the somatodendritic axis. Furthermore, we find that an exponential increase in single-channel number underlies the nonuniform spatial distribution of Ih, and show that stochastic gating of Ih channels leads to significant voltage membrane noise. 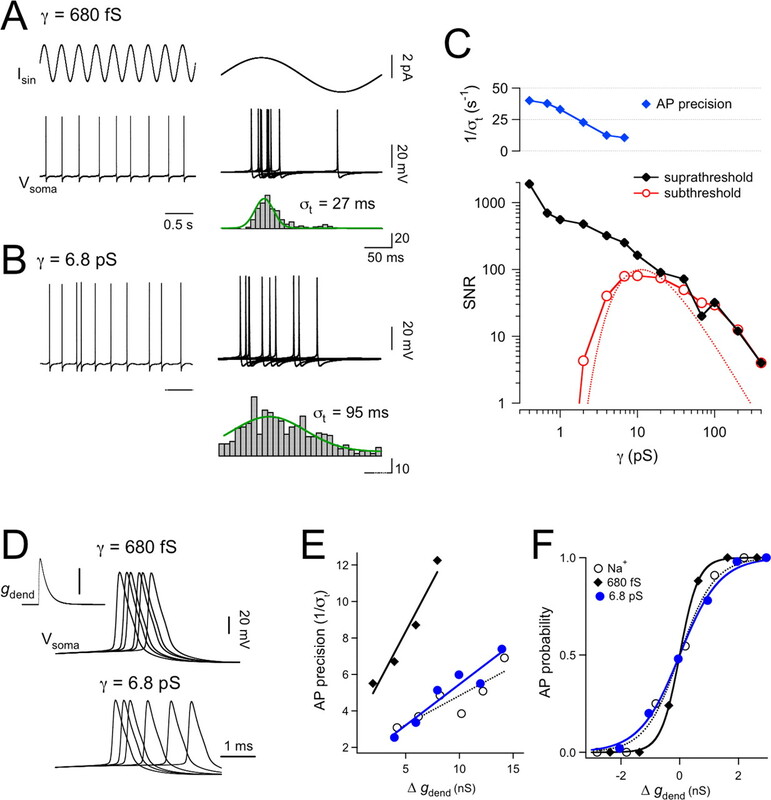 Finally, we demonstrate using simulations that fluctuations in membrane potential attributable to Ih channel gating are sufficiently large to influence action potential (AP) fidelity in response to synaptic or weak periodic perithreshold inputs. Male Wistar rats (28–70 d) were deeply anesthetized by halothane inhalation. After decapitation, the brain was quickly removed, and sagittal brain slices (300 μm) of somatosensory cortex were prepared according to guidelines approved by the Animal Ethics Committee of the Australian National University. Throughout the preparation of slices, the brain was maintained in ice-cold artificial CSF (ACSF) of the following composition (in mm): 125 NaCl, 25 NaHCO3, 3 KCl, 1.25 NaH2PO4, 25 glucose, 0.5 CaCl2, and 6 MgCl2, pH 7.4 (95% O2/5% CO2). After cutting, slices were transferred to a holding chamber filled with the same ACSF maintained at 35°C for 45 min and subsequently stored at room temperature. Individual slices were transferred to the stage of an upright microscope (BX51WI; Olympus Optical, Tokyo, Japan) equipped with differential interference contrast (DIC) optics, and the apical dendrites of layer 5 pyramidal neurons were visualized under infrared (IR) light (Stuart and Sakmann, 1994). The recording chamber was perfused with oxygenated (95% O2/5% CO2) ACSF consisting of the following (in mm): 125 NaCl, 25 NaHCO3, 3 KCl, 1.25 NaH2PO4, 25 glucose, 2 CaCl2, and 1 MgCl2. Somatic and dendritic cell-attached recordings were performed with borosilicate glass pipettes (Harvard Apparatus, Edenbridge, Kent, UK) pulled to a uniform resistance of ∼10 MΩ, and filled with the following solution (in mm): 120 KCl, 20 tetraethylammonium-Cl, 10 HEPES, 5 EGTA, 5 4-AP, 1 MgCl2, 1 or 3 BaCl2, 1 NiCl2, 0.5 CdCl2, and 0.001 TTX, pH 7.4 (285 mOsm). For NSFA, a high concentration of BaCl2 (3 mm) was included to block large-conductance channel openings of inward-rectifying K+ channels. Somatic and dendritic whole-cell recordings were made with pipettes containing 135 mm K-gluconate, 7 mm NaCl, 2 mm MgCl2, 2 mm Na2ATP, 0.3 mm NaGTP, 10 mm HEPES, pH 7.2 with KOH, and 0.2% biocytin (Invitrogen, Carlsbad, CA). All data were obtained at 34 ± 1°C. Currents were recorded with an Axopatch 200B amplifier (Molecular Devices, Union City, CA) in capacitive feedback mode and collected using an ITC-18 computer interface (InstruTech, Port Washington, NY). All signals were analog low-pass filtered at 10 kHz (eight-pole Bessel) and digitally sampled at 20 kHz using the data acquisition software Axograph (Molecular Devices). Ensemble traces were further digitally filtered at the indicated frequencies (see below). Baseline recording noise was ∼600 fA root mean square (rms) at 5 kHz bandwidth and 1.0 pA at 10 kHz. The bath level of the recording chamber was kept to a minimum to reduce fast capacitance transients. Remaining transients were cancelled with capacitance compensation. Leak subtraction was generally performed off-line using scaled and averaged leak pulses (50 repetitions) using a P/10 protocol. Voltage signals were recorded with a BVC-700 current-clamp amplifier (Dagan, Minneapolis, MN), filtered at 1 kHz, and sampled at 2 kHz. Capacitance transients and access resistance were compensated with the amplifier circuits. The instrumental noise from the electrode-amplifier circuit was estimated to be ∼40 μV by replacing the electrode holder with a model cell (500 MΩ/33 pF; Molecular Devices). Synaptic conductances were blocked by bath application of 50 μm d-APV, 20 μm DNQX, and 50 μm bicuculline-methobromide, and Na+ channels were blocked with 1 μm TTX (Tocris Bioscience, Bristol, UK). To investigate the impact of Ih channel gating on voltage noise, we bath applied the Ih antagonist ZD 7288 [4-(N-ethyl-N-phenylamino)-1,2-dimethyl-6-(methylamino) pyrimidinium chloride] in recordings in which somatic noise was >100 μV. Cells with large spontaneous fluctuations in resting potential were disregarded from analysis. Some neurons (see Fig. 1A) were processed for biocytin and reconstructed post hoc with Neurolucida (MicroBrightField, Williston, VT). Ih current distribution, kinetics, and single-channel properties. A, Schematic of the experimental setup during dendritic cell-attached recording 700 μm from the soma of a layer 5 pyramidal neuron (reconstructed from a biocytin fill). The different cortical layers are indicated. An example of Ih current evoked by a 100 mV hyperpolarizing pulse from a holding potential 25 mV depolarized from rest is shown before and after bath application of ZD 7288 (50 μm). B, Ih current density plotted against distance from the soma (n = 88). Data fitted with a single-exponential function. C, Ih voltage-activation curve generated from tail currents (inset) during hyperpolarizing steps between −40 and −150 mV (n = 9; 680 ± 21 μm from the soma). Data fitted with a Boltzmann function. D, Superimposed successive single traces used for NSFA elicited by a 100 mV hyperpolarizing step (recorded 500 μm from the soma). Only 10 of 100 traces are shown. The corresponding subtracted differences from the 10 traces are given in the bottom panel. Currents were off-line digitally filtered at 100 Hz. E, Fluctuation analysis of data in D. Data of 100 successive sweeps were used to plot mean Ih current (black trace) and variance (gray trace) as a function of time. F, Variance-mean plot for the data in E. The data were well fitted by a parabola (black line) from which the single-channel amplitude i, the maximum number of channels N, and the open probability Po were obtained. The patch holding potential was calculated assuming a resting potential at the soma of −79 mV, estimated from perforated-patch recordings (Gulledge and Stuart, 2003). In addition, we corrected for a distance-dependent depolarization of the membrane potential of ∼1 mV/100 μm (supplemental Fig. S1, available at www.jneurosci.org as supplemental material) and a liquid junction potential of the cell-attached solution of −3 mV (Williams and Stuart, 2000). Somatic whole-cell voltage was corrected for the −14 mV difference between the resting membrane potential during perforated-patch and whole-cell recordings (Gulledge and Stuart, 2003), primarily attributable to the liquid junction potential of the whole-cell pipette solution (−12 mV). The distance of the dendritic recording site from the soma was measured in situ from the IR-DIC image and taken to be the linear distance between the recording site and the beginning of the apical trunk. Steady-state activation curves (see Fig. 1C) were constructed from the amplitude of tail currents after voltage steps to different amplitudes (Williams and Stuart, 2000). These data were normalized to the maximum tail current amplitude and fitted with a single Boltzmann function. Activation time course of Ih onset was described by double-exponentials fits from which an amplitude weighed single exponential, τw = (Aτfast + Bτslow)/(A + B), was calculated. The deactivation time course was well described by a single-exponential function. Average values are expressed as mean ± SEM. NSFA of recorded, as well as simulated, Ih currents was performed according to recently described routines for voltage-dependent channels (Conti et al., 1980; Sigworth, 1980; Alvarez et al., 2002) written in and analyzed with Igor Pro 5.01 (WaveMetrics, Lake Oswego, OR). In brief, assuming that the macroscopic ionic current at a given time point (t) is dependent on the single-channel properties, such that I(t) = NγPo(V,t) (V − VREV), where I is the current, and V the membrane voltage. The current is the product of N, the maximum number of channels, γ, the elementary single-channel conductance, Po, the probability of channel opening at maximum steady-state current, and the electrical driving force, V − VREV, where VREV is the reversal potential. Here, B is a background noise offset, and 〈I〉 is the mean current. At the first root of the parabola, the slope equals the single-channel amplitude i. Variance-mean plots were calculated from data beginning 2 ms after the start of the voltage pulse to the maximum of the steady-state mean amplitude. Single-channel conductance, γ, was estimated by i/(V − VREV), and the open probability, Po, was determined by Po = Imax/(iN), where Imax is the average current amplitude at steady state. The reversal potential (VREV) was experimentally measured to be ∼0 mV (0.5 ± 2.6 mV; n = 4) with 120 mm external K+ and zero Na+. For 60 mm external K+ and Na+, and 2.5 mm external K+ and 120 mm external Na+, we calculated a VREV of −16 and −45 mV, respectively, based on the Goldman–Hodgkin–Katz equation assuming an Na+ to K+ permeability ratio of 0.4 and 0.2 (Hestrin, 1987). Similar values of N, i, or Po were obtained during NSFA of the first 200 ms (n = 18; p > 0.3) and also after exponential sampling (n = 18; p > 0.7), where mean current and variance were sampled in an exponentially manner based on τw. Single Ih channel currents in the models shown in Figure 2 were simulated at 20 kHz temporal resolution (identical to the sampling frequency of recordings) with the high quality pseudorandom number generator in Igor Pro [compare with function ran2 by Press (2002)]. The uniformly distributed number, u, between 0 and 1 was used to generate an exponentially distributed interval −(1/a) × ln(u), where a is the sum of the rate constants from one state to all neighboring states. Another random number was used to decide which state was visited next (Colquhoun et al., 2003). Simulated macroscopic Ih currents, with activation kinetics similar to the weighed activation time constant of experimental data (τw = 50 ms), were generated by the addition of the appropriate number of single-channel currents. Realistic recording noise (1 pA rms at 10 kHz) was simulated by adding white noise (simulated with Igor Pro; Box-Müller transformation) with 1.22 pA rms to each point. Filtering with a low-pass Gaussian filter with a cutoff frequency of 10 kHz resulted in 1 pA rms, similar to that observed in patch-clamp recordings after low-pass filtering at 10 kHz using the eight-pole Bessel filter of the amplifier. As in the experimental situation, we repeated this procedure 100 times. The resulting 100 simulated macroscopic currents were analyzed with NSFA identical to the recorded data. Leak subtraction was implemented by subtracting a simulated empty leak current (an average of 50 traces of 1 pA rms noise scaled up by a factor of 10) from the mean current. Accuracy of parameters extracted with NSFA. A, Ih channels simulated with a simple gating model. The rate from the closed (C) to the open (O) state was set to be 20 s−1, and Po was set to 1. The right panel shows an example of a simulated single-channel trace with amplitude i of 100 fA. B, Flickering Ih channels were simulated by adding an additional shut state C2 to the scheme used in A. The rate into and out of the open state, δ, was equal, leading to Po = 0.5. The other channel rates are not changed. The right panel shows an example of a simulated single-channel trace with the flicker frequency δ set to 1000 s−1. For clarity, only 100 ms of the 400 ms trace is shown. C, Examples of variance-mean plots of simulated Ih channels with δ set to 1000 s−1 using a filter cutoff frequency, fc, of 100 Hz (left) and 10 kHz (right). The parameters obtained from NSFA fitting (black lines) are indicated. D, The influence of filtering on the parameters extracted with NSFA was investigated systematically by varying fc from 2 Hz to 10 kHz. The lines represent simulations with different flickering frequencies (δ ranging from 200 to 5000 Hz). With increasing flickering frequency, higher cutoff frequencies are required to extract the correct parameters using NSFA. The dotted lines represent the parameters obtained with the nonflickering C–O model. E, Variance-mean plots for experimental data recorded 500 μm from the soma and low-pass filtered at 100 Hz (left) or 10 kHz (right). The parameters obtained from NSFA are indicated. F, The single-channel parameters i, N, and Po are plotted versus fc for the experimental data shown in E. Note the high similarity to the nonflickering model (C–O) shown in D.
The impact of Ih channel fluctuations on AP output was simulated using a morphological realistic compartmental model of a large layer 5 pyramidal neuron (Stuart and Spruston, 1998, their Fig. 1A) in NEURON (version 5.7, available at http://www.neuron.yale.edu/neuron/). Spines were incorporated by decreasing Rm and increasing Cm twofold in spiny compartments. The passive properties Rm (15 kΩ/cm2), Cm (1 μF/cm−2), and Ri (100 Ω/cm) were uniformly distributed, and the resting membrane potential Vm was set at −89 mV, equivalent to the experimentally recorded Vm when Ih was blocked with 50 μm ZD 7288. To account for active properties, voltage-gated channels (Schaefer et al., 2003) were incorporated at the following densities. The soma contained (in pS/μm2) gNa = 54, gKv = 200, gKaP = 0.008, gKca = 3, gKm = 0.1, calcium gCa = 0.3, and gCa,T = 0.0008. In the dendrites the channel densities were as follows: gNa = 27, gKv = 25, gKaP = 0.008, gKca = 1.5, gKm = 0.05, gCa = 0.8, and gCa,T = 0.0005. In the reconstructed axon, Na+ and K+ channels were included with a density of gNa = 30,000 and gKv = 400. We set AP threshold to −63 mV (Gulledge and Stuart, 2003). Synaptic inputs were simulated as conductances with 0.2 ms rise and 2 ms decay time constants and a reversal potential of 0 mV (Häusser and Roth, 1997). The nominal temperature was set to 35°C. The conductance density of Ih (gh) was distributed across compartments using the following exponential function: gh = y0 + A exp(d/λ), with y0 = −2 pS/μm−2, A = 4.28 pS/μm−2, λ = 323 μm, and d is the distance from the soma. These values were obtained from an exponential fit to the experimental data in Figure 1B after correction for the 5.1-fold reduction in Ih conductance under physiological conditions in which the external potassium concentration is 2.5 mm (supplemental Fig. S2, available at www.jneurosci.org as supplemental material) and assuming a membrane area of 4.5 μm2 at the pipette tip (Engel and Jonas, 2005). The corrected and scaled gh implemented in NEURON gave rise to a range of Ih densities between 2.3 pS/μm2 at the soma to 93 pS/μm2 in the distal apical dendrites ∼1000 μm from the soma and led to changes in Vm that were found experimentally (supplemental Fig. S1, available at www.jneurosci.org as supplemental material). The Ih reversal potential was set at −45 mV. This led to Hodgkin–Huxley-type channel kinetics with single exponential activation kinetics (power = 1) and no inactivation (Hodgkin and Huxley, 1952). The five free parameters, A, B, C, D, and E, were determined by simultaneously fitting 1/(α(v) + β(v)) to the voltage dependence of the time constant of Ih activation and deactivation and α(v)/(α(v) + β(v)) to the activation curve (see Fig. 6A). The sum of squared errors was minimized using the Levenberg–Marquardt method (Mathematica 4.1; Wolfram Research, Champaign, IL), with the time constants of activation and deactivation weighed with the inverse of the maximum value in the dataset, and the voltage activation curve weighed with 10 times the inverse of the maximum value in the dataset. The resulting parameters were A = 6.43 s−1, B = 154 mV, C = 11.9 mV, D = 193 s−1, and E = 33.1 mV and predicted the data adequately (see fits in Fig. 6A). Stochastic Na+ channels (see Fig. 7E,F) were modeled with a kinetic reaction scheme of eight states describing the m3h Hodgkin–Huxley activation kinetics (Hille, 1978, 2001). As with stochastic Ih channels, each Na+ channel had the chance to move to one of its neighboring states within the iteration time, dtnrn, with the appropriate probability. The kinetic rate constants were based on previously published Na+ channel models (see http://senselab.med.yale.edu/senselab/modeldb/). For both stochastic Ih and Na+ channels, the number of channels in each segment, was calculated from the current density and the surface area. For each iteration time point dtnrn, the numbers of channels in the open and the closed state were stored, and the “macroscopic” Ih and Na+ current were determined by summation of the appropriate number of single-channel events. Simulations were performed on three Intel Pentium processors 2.6 GHz, one 64-bit opteron AMD processor (2 × 1.6 GHz), and one Linux Cluster that contained 18 machines, each with two 2.6 GHz Intel Xeon central processing units housed in two IBM BladeCenters. The dtnrn was set to 10 or 100 μs for simulations using stochastic Ih or 1 μs for simulations using stochastic Na+ channels. The power spectral density (PSD) of voltage (see Figs. 5, 6) was generated with Igor Pro from a 25 s sweep using the square-window method and fitted with a Lorentzian function, S = A/(1 + (f/fc)2) (DeFelice, 1981). The predicted change in σV, when changing γ (see Fig. 6D), was based on theoretical work indicating that the variance of the macroscopic current, σI2, is proportional to γ2N (for an example, see Diba et al., 2004, their Eq. 15). Because the current density was the same in models with different single-channel conductance (i.e., γN = constant), σI2 is proportional to γ. Thus, σI is proportional to √γ. The similarity between obtained and predicted voltage noise, σV,predicted(γ) = σV(680 fS) √(γ/680 fS), indicates a linear relationship between σV and σI in our model. where ϵ is the signal strength, ΔU is a constant related to the threshold barrier height, and D is noise intensity. For D, the variance of the somatic membrane potential was used (Wiesenfeld et al., 1994), calculated from the fit to Figure 6D. The two free parameters ϵ and ΔU were fitted with nonlinear least-squares regression with Igor Pro. Input/output curves (see Fig. 7F) were normalized, aligned to the synaptic conductance that generated APs with a probability of 0.5, and fitted with the sigmoid function APprob (Δg) = (1 + exp(−Δg/s))−1, where Δg is the change in synaptic conductance, and s represents the steepness of the AP probability curve. Cell-attached patch-clamp recordings were made from the apical dendrites of large layer 5 pyramidal neurons up to 900 μm from the soma, and Ih currents evoked by hyperpolarizing pulses from a holding potential 25 mV depolarized to the resting membrane potential (Fig. 1A). These currents could be blocked by 82 ± 7% (n = 3) by bath application of 50 μm of the Ih antagonist ZD 7288 (BoSmith et al., 1993; Robinson and Siegelbaum, 2003), indicating adequate specificity for Ih (Fig. 1A). To determine the dendritic distribution of Ih current, we plotted Ih current density against distance of the recording site from the soma (Fig. 1B). The distribution was well described by a single-exponential function (Fig. 1B), from which it can be inferred that Ih current density increases e-fold with every 325 μm. The time course of Ih current onset during 100 mV hyperpolarizing steps was best fit with a double-exponential function, with a τfast of 27.0 ± 1.5 ms and τslow of 155 ± 8 ms (n = 88). The ratio of the amplitude of the fast to slow time constants was 4.9 ± 0.3, indicating that fast activation kinetics dominate. The weighed single time constant of Ih activation was calculated to 49.7 ± 3.0 ms (n = 88). Steady-state voltage-activation curves were well described by a single Boltzmann function with a half-maximum activation (Vhalf) of, on average, −110 ± 1.5 mV and a slope constant of 10.1 ± 0.5 mV (n = 9) (Fig. 1C). At a few dendritic sites, cell-attached patch recordings were subsequently made with a saturating concentration of 8-Br-cAMP (100 μm, in the patch-pipette) to test for cyclic nucleotide modulation of Ih. On average, application of 8-Br-cAMP had no effect on the activation kinetics (τfast control, 22.0 ± 2.1 ms; cAMP, 21.4 ± 0.9 ms; paired t test, p > 0.9; n = 10) or the Vhalf (100 μm cAMP, −106 ± 0.9 mV; n = 3). These data are in good agreement with the relative insensitivity of the HCN1 isoform to cAMP regulation (Santoro and Tibbs, 1999) and an abundant expression of HCN1 in the layer 5 dendrites (Notomi and Shigemoto, 2004; Santoro et al., 2004). To examine the properties of single Ih channels, we used NSFA of macroscopic Ih currents (Conti et al., 1980; Sigworth, 1980; Alvarez et al., 2002). Ih currents in these experiments were activated by 400 ms hyperpolarizations to maximize the number of possible repetitions. Filtering of individual sweeps (Fig. 1D, top) was performed with a digital Gaussian filter at 100 Hz and the current variance (σ2) calculated from the difference between 100 consecutive sweeps (Fig. 1D, bottom). The plot of the current σ2 versus time had a peak coinciding with half-maximal activation at ∼25 ms (Fig. 1E). Plots of the current σ2 against mean Ih current amplitude could be well fit with a parabolic function, from which the single-channel amplitude (i), the total number of channels (N), and open probability (Po) can be estimated (Fig. 1F). On average, at dendritic sites ∼500 μm from the soma, NSFA gave estimates of i of 88 ± 9.9 fA, N of 342 ± 24, and Po of 0.92 ± 0.03 (n = 5) during hyperpolarizing voltage steps of 100 mV from an estimated patch holding potential of approximately −50 mV. How accurate are the values for i, N, and Po obtained from NSFA? To assess this, we simulated Ih channels and performed NSFA on simulated macroscopic Ih currents. These simulations used Ih channels with activation kinetics similar to that observed experimentally (single exponential kinetics with τ of 50 ms). Two different channels were simulated, one without flicker (Fig. 2A, C–O) and one with channel flicker (Fig. 2B, C–C–O). In both cases, i was 100 fA and N was 500. In the case of the nonflickering channel, Po was 1 (Fig. 2A), whereas Po was 0.5 in the flickering channel (Fig. 2B, forward and backward rates, δ, into and out of the open state were equal). Simulated macroscopic Ih current traces were generated by adding 500 single-channel traces (Fig. 2A,B) and realistic recording noise. These currents were digitally filtered at frequencies ranging from 2 Hz to 10 kHz and subjected to NSFA. An example of the effect of filtering on variance-mean plots for simulated Ih channels using a model with 1 kHz flicker is shown in Figure 2C after filtering at 100 Hz or 10 kHz. A full analysis of the impact of filtering on the parameters extracted with NSFA for the nonflickering and flickering models is shown in Figure 2D. These plots indicate that, in the nonflickering model, i is underestimated during filtering at less than ∼20 Hz or more than ∼1 kHz (Fig. 2D, left), leading to overestimations of N (data not shown), whereas Po increased monotonically with filter cutoff frequency (Fig. 2D, right). These simulations suggest that, in a situation in which there is no channel flicker, the best estimates of single Ih channel parameters are obtained after filter at ∼100 Hz. The situation was reversed in models with channel flicker, with the estimated value of i increasing monotonically with cutoff frequency (Fig. 2D, left), whereas Po increased and then decreased with increasing cutoff frequency and only converged to its appropriate value (0.5) at the highest cutoff frequencies tested (Fig. 2D, right). Thus, under conditions of high-frequency channel flickering, NSFA will only be accurate when the cutoff frequency is set at or above 10 kHz. of the time constant of channel activation (Alvarez et al., 2002). In neocortical dendrites, Ih has a weighted time constant of activation of ∼50 ms. Thus, in our case, τfilter should not be >5 ms, corresponding to a low-pass cutoff frequency (fc) of 1/(2πτfilter) or ∼30 Hz. Finally, we investigated the accuracy of the parameters extracted with NSFA under a large range of different signal-to-noise conditions in our nonflickering model filtered at 100 Hz by varying i and N systematically (supplemental Fig. S3, available at www.jneurosci.org as supplemental material). From these simulations, we found that, if the amplitude of macroscopic Ih currents is <1 pA or i is <10 fA, the errors in i, N, and Po are large (> 50%) and thus highly inaccurate. However, if the macroscopic Ih current is >10 pA, as typically found in this study, the errors are <20%. Together, these simulations indicate that NSFA has sufficient precision to accurately estimate the single-channel parameters of Ih channels under our recording conditions. Does NSFA of macroscopic Ih currents accurately describe the voltage-dependent properties of Ih? To address this, hyperpolarizing pulses of −100 and −60 mV amplitude were alternated at 1 s intervals, and NSFA was performed on the obtained variance-mean relationships (Fig. 3A) (six patches ∼570 μm from the soma). Because the total channel number N cannot be estimated precisely when channels are not fully activated, we fixed N during fitting of variance-mean plots for −60 mV steps to the value estimated during NSFA of −100 mV steps in the same patch. From this analysis, Po was estimated to be, on average, 0.94 ± 0.03 during −100 mV steps and 0.55 ± 0.05 during −60 mV steps (n = 6). These estimates of Po follow a voltage dependence similar to that obtained for the Ih activation curve determined from tail currents (Fig. 3B). The unitary amplitude, i, was significantly smaller during −60 mV steps compared with −100 mV steps (Fig. 3C, left) (p < 0.001), as expected because of the reduced driving force, whereas the unitary conductance, γ, was not statistically different (Fig. 3C, right) (p > 0.13). In conclusion, the results above indicate that NSFA of macroscopic Ih currents accurately describes the voltage-dependent properties of single Ih channels. Voltage-dependent properties of Ih obtained with NSFA. A, Top, Ih currents evoked by hyperpolarizing steps to −150 mV (left) and −110 mV (right). Bottom, Fitting variance versus mean of the plots (black line) yielded a Po of 1.05 with 889 channels and i of 109 fA during steps to −150 (left), whereas Po was reduced to 0.51 and i to 91 fA during steps to −110 mV (right). N was fixed to that obtained during steps to −150 mV (889) during fitting of the NSFA data for steps to −110 mV (black line). B, Pooled data (n = 5) of Po during steps to −150 mV (0.94 ± 0.03) and −110 mV (0.54 ± 0.05; filled circles) is consistent with the activation curves obtained from Ih tail-current amplitudes (open circles; same data as in Fig. 1C). C, Histogram of single-channel current amplitude i (left) and conductance γ (right) extracted with NSFA during steps to −150 and −110 mV. **p < 0.001 (n = 6). Previous studies on Ih in layer 5 pyramidal dendrites have reported a significantly higher current density at distal dendritic locations (Williams and Stuart, 2000; Berger et al., 2001). Because the macroscopic Ih current is determined by the product of i, N, and Po, we can now separate which of these factors underlies the highly nonuniform subcellular distribution of Ih in these neurons (Fig. 1B). Three examples of variance-mean plots obtained from recordings 270, 400, and 740 μm from the soma are shown in Figure 4A. Figure 4B shows that, when Po is plotted as a function of recording location, for distances from ∼120 to 900 μm from the soma, no clear dependence exists on dendritic site. Similarly, the Ih single-channel conductance, γ, was independent of the dendritic recording location (Fig. 4C). Plotting γ as a histogram indicates that γ represents a single population with average amplitude of 676 ± 35 fS (Fig. 4C, inset) (n = 18). In contrast, N was found to rise steeply with distance from the soma (Fig. 4D). An exponential fit to this data indicates that N increases e-fold for a 240 μm path length along the main apical dendrite of layer 5 pyramidal neurons, similar to the e-fold change in current density (Fig. 1B). At the most distal dendritic locations examined (900 μm from the soma), we observed as many as ∼2500 Ih channels per dendritic patch, whereas at the most proximal sites (120 μm from the soma), as few as 40 channels per patch were observed. This gradient is essentially identical to the reported 60-fold increase in immunogold-labeled HCN1 particles in layer 5 dendritic membrane (Lorincz et al., 2002). These data correspond to Ih channel densities of 9–550/μm2, assuming a membrane patch area of ∼4.5 μm2 (Engel and Jonas, 2005). The high density of Ih in the distal dendrites of layer 5 pyramidal neurons is comparable with the density of voltage-activated Na+ channels found at nodes of Ranvier (Hille, 2001). In conclusion, these data indicate that the nonuniform scaling of Ih current density is generated by an exponential increase in channel number per dendritic membrane area, leading to high channel densities in distal dendrites. NSFA reveals a distance-dependent increase in N. A, Superimposed examples of variance-mean plots for three dendritic locations (270, 400, and 740 μm from the soma) with the variance-mean fits (black lines). B, Plot of open probability Po versus recording distance from the soma. Data were fitted with a regression (slope of −0.015; n = 18). C, Plot of single-channel conductance γ versus distance from the soma. Data fitted with a linear regression (slope of +0.11; n = 18). Inset shows a histogram of γ revealing a single population well fitted with a Gaussian function (n = 18). D, Plot of the number of channels per patch (N) versus distance (d) from the soma. The data are well described by a single-exponential function of the form: 49 × exp(d/240) + 47, indicating that the Ih channel number increases e-fold for a 240 μm change in distance. The results above indicate that Ih channels have a very small single-channel conductance yet can be expressed at very high densities. Why is the single-channel conductance of Ih so small? Clearly, it would be energetically more efficient to increase single-channel conductance, for example by 10-fold to 6.8 pS, thereby reducing channel number by a factor of 10 for the same current density. One possible explanation for the small single-channel conductance of Ih is that there are other constraints on the system, such as voltage noise. Previous work indicates that the stochastic opening and closing of voltage-dependent channels can generate fluctuations in membrane potential, which could be a significant source of voltage noise in excitable cells (DeFelice, 1981; White et al., 2000). To directly address whether the stochastic gating of single Ih channels contributes to membrane noise, we recorded voltage noise at the resting membrane potential in the presence of blockers for NMDA, AMPA, GABAA, and Na+ channels. In Figure 5, an example is shown of control membrane potential fluctuations at the soma with an SD, σV, of 122 μV (Fig. 5, black trace). To isolate the contribution of Ih channels to these voltage fluctuations, we bath applied 50 μm ZD 7288 (BoSmith et al., 1993). This led to a hyperpolarization of the somatic resting membrane by 11 mV (average change, −10.3 ± 0.5 mV; n = 6), which was corrected for by positive DC injection to obtain a similar resting membrane potential as in control (−77.9 mV). Under these conditions, σV was reduced to 89 μV (Fig. 5, gray trace). Spectral analysis of traces before and after ZD 7288 showed that Ih noise is particularly dominant in the low-frequency range (Fig. 5, left). On average, application of ZD 7288 lead to a reduction of σV by 33 ± 7 μV (Fig. 5, right) (n = 6; paired t test, p < 0.01), showing that native Ih channels contribute significantly to voltage noise at resting membrane potentials. 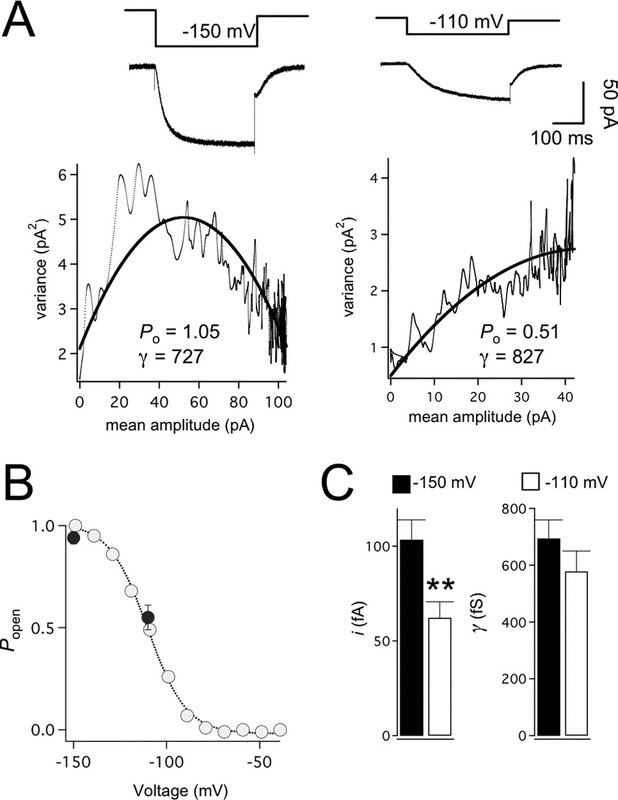 Impact of Ih channel gating on somatic voltage noise. Whole-cell somatic voltage recordings before (top trace; black) and after (bottom trace; gray) Ih channel block by bath application of ZD 7288 (50 μm). All data were recorded in the presence of synaptic blockers and TTX. 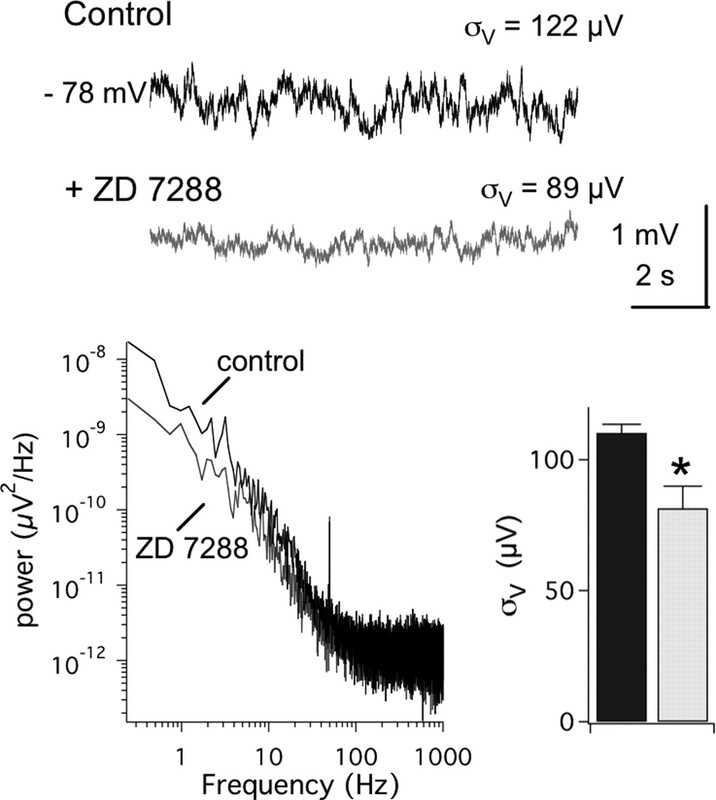 DC injection was used to maintain the same membrane potential in control and ZD 7288. Left, Power spectrum of the same traces indicating that ZD 7288 attenuates voltage fluctuations in the low-frequency range. Right, Population data of the average SD, σV, of the somatic voltage noise in control (black bar) and ZD 7288 (gray bar). Next we investigated the impact of Ih single-channel properties on membrane voltage noise using a model in which single-channel conductance and number could be varied in a controlled manner. A stochastic Hodgkin–Huxley model of Ih based on our experimental data (Fig. 6A) was introduced into a morphologically realistic model of a layer 5 pyramidal neuron (Fig. 6B). The model contained voltage-activated Na+, K+, and Ca2+ conductances distributed uniformly throughout the dendritic tree, together with a stochastic Ih channel model distributed exponentially to mimic the experimentally observed increase in Ih current density with distance from the soma (Fig. 1B). Addition of Ih depolarized the soma by 10 to −79 mV and set the membrane potential in the very distal tuft branches to −65 mV. This effect of Ih on the resting membrane potential was quantitatively similar to experimentally observed changes in membrane potential with distance from the soma (supplemental Fig. S1, available at www.jneurosci.org as supplemental material). Impact of Ih channel single-channel conductance on voltage noise in a model. A, Modeling of Ih kinetics using Hodgkin–Huxley (H–H) formalism. Steady-state voltage-activation curve (top) and the voltage dependence of activation (weighted single time constant; filled circles, bottom) and deactivation (open circles) together with the predictions from the Hodgkin–Huxley Ih model (lines). B, Left, Morphology of the compartmental layer 5 neuron. Conductance densities at the soma and a distal dendritic location, together with representative examples (right) of the resting membrane potential at the soma (−79 mV; bottom trace) and distal dendrites (−63 mV; 1000 μm from the soma; top trace) using a model with single-channel conductance γ of 680 fS. C, The power of somatic membrane potential fluctuations versus frequency for models with γ of 680 fS (black) and 6.8 pS (gray). Data fitted with a Lorentzian function (see Materials and Methods) from 1 to 30 Hz giving a cutoff frequency fc of 6.0 and 4.2 Hz, respectively, in the models with γ of 680 fS and 6.8 pS. D, The SD of the resting membrane potential σV plotted against γ and total N used in the simulations. The squares represent σV at the soma and the circles σV at a dendritic position 1000 μm from the soma. The lines are the predicted relationship between σV and γ (see Materials and Methods). We first performed simulations using Ih channels with a single-channel conductance of 680 fS, the experimentally determined value. Figure 6B shows that, using this model, small fluctuations in somatic membrane potential occur with a σV of 40 μV (Fig. 6B, bottom trace). As expected, because of the higher density of Ih in distal dendrites, as well as their small diameter, fluctuations in membrane potential at distal dendritic locations (1000 μm from the soma) were significantly larger than at the soma, with σV being 129 μV (Fig. 6B, top trace). We next performed simulations with a single-channel conductance of 6.8 pS, 10-fold greater than observed experimentally while maintaining the same current density by scaling down N. Note that 6.8 pS is still in the low range compared with the single-channel conductance of most other ion channels (Hille, 2001). Increasing the Ih single-channel conductance, γ, to 6.8 pS increased σV to 129 μV at the soma (Fig. 6C, bottom, gray trace) and up to 408 μV in dendritic compartments ∼1000 μm from the soma (data not shown). Analysis of the PSD of voltage fluctuations indicated that this increase in membrane noise was similar at all frequencies of the power spectrum (Fig. 6C). The cutoff frequency of the PSD was slightly lower at the soma than in the dendrites (∼5 vs ∼8 Hz), presumably because of greater “filtering” of voltage fluctuations at the soma by the larger somatic capacitance (data not shown). To compare the voltage noise introduced by Ih with that generated by channel noise from voltage-activated Na+ channels, we performed simulations using a stochastic Na+ channel model with γNa = 10 pS. In these simulations, we used a deterministic Ih model to allow us to isolate the contribution of voltage-activated Na+ channels to membrane noise independent of Ih channel noise. At resting membrane potentials, stochastic Na+ channels generated membrane noise with σV = 7.3 μV at the soma, significantly smaller than the observed σV = 40 μV in models with stochastic Ih channel (γ = 680 fS). In dendritic compartments ∼1000 μm from the soma, σV increased to 47 μV (compared with 129 μV for Ih channels). These data indicate that, at resting membrane potentials, the voltage noise attributable to stochastic gating of Ih channels is significantly larger than that mediated by Na+ channels. Despite the uniform dendritic Na+ channel density in the model, the Na+ channel voltage noise was greatest at distal dendritic locations. Given recent experimental evidence that Na+ channel noise is greater at depolarized potentials (Jacobson et al., 2005), we reasoned that the larger membrane fluctuations at distal dendritic locations were generated by increased activation of voltage-dependent Na+ channels as a consequence of the depolarizing action of nonuniform Ih (supplemental Fig. S1, available at www.jneurosci.org as supplemental material). Consistent with this idea, when the Ih density in our model was set to be low and uniform, leading to a homogeneous resting potential of −83 mV, the σV of Na+ channel-induced membrane noise was 2.7 μV in both distal dendritic and somatic compartments. This suggests a dual role for Ih on membrane noise in the distal dendrites: increasing membrane noise via the high density of distal dendritic Ih channels, as well as via depolarization-induced activation of dendritic Na+ channels. The relationship between γ, N, and σV is depicted in a log–log plot in Figure 6D. Previous theoretical work indicates that the current variance, σI2, is proportional to N and the square of γ (White et al., 2000; Diba et al., 2004). Consistent with this idea, the observed change in σV was well predicted by the expected change in current noise, with σV proportional to the square root of γ (Fig. 6D). These simulations indicate that the impact of Ih single-channel conductance on voltage noise follows known theoretical descriptions of the contribution of single-channel properties to current noise. From this, it follows that, for a given current density, reducing Ih single-channel conductance, rather than channel number, is the most effective means to reduce the impact of stochastic gating of Ih on membrane noise. To assess the functional implications of Ih channel noise, we first analyzed the probability and timing of AP generation in response to weak periodic suprathreshold inputs. A small sinusoidal current (3 Hz; 4 pA peak-to-peak) was injected into the soma together with a larger DC adjusted to elicit one AP per sine-wave cycle in models with deterministic Ih. These current injections elicited, on average, one AP per sine-wave cycle in models with stochastic Ih with a single-channel conductance, γ, of 680 fS (Fig. 7A). The ability to detect the sinusoidal signal (the SNR) was quantified from the 3 Hz peak in the PSD (see Materials and Methods). The temporal precision of AP output was quantified from the SD of the temporal jitter in AP timing (σt) (Fig. 7A). Increasing γ 10-fold to 6.8 pS led to an increase in AP failures and spontaneous APs not phase locked to the peak of the weak input signal (Fig. 7B), leading to a decrease in both the SNR (Fig. 7C, black diamonds) and temporal precision (Fig. 7C, blue diamonds). Systematic variation of γ between 0.4 and 400 pS showed that, as γ increases, there is an ∼100-fold decrease in SNR and a qualitatively similar decrease in temporal precision (Fig. 7C, diamonds). Impact of Ih single-channel noise on the fidelity of AP output in the model. A, Somatic injection of a small suprathreshold sinusoidal current signal (Isin = 4 pA; 3 Hz; top trace) elicited, on average, one AP per sine-wave cycle (bottom trace) in a model with γ of 680 fS. Right, Superimposed responses on an expanded time scale. Bottom, Histogram of AP onset latency relative to the phase of the sine wave for 400 consecutive sine-wave cycles. Data were fitted with a Gaussian function (green line) with SD σt. B, Corresponding plots as in A but with increased γ to 6.8 pS. Note the threefold increase in AP jitter. C, SNR determined from the 3 Hz peak in the power-spectrum density, and temporal precision (blue diamonds, 1/σt) are plotted as a function of γ (range, 0.4–400 pS). Subthreshold sinusoidal current injections (red; Isin = 4 pA) and suprathreshold injections (black; Isin = 4 pA) were analyzed for stochastic resonance. The dotted lines are fits according to stochastic resonance theory (see Materials and Methods). D, Superimposed sweeps of APs evoked by a simulated excitatory synaptic conductance (gdend; left trace; calibration bar, 60 nS) injected 400 μm from the soma in models with single-channel conductance γ of 680 fS (top) and 6.8 pS (bottom). Note the larger trial-to-trial variability (jittering) in models with large γ. E, Spike precision defined as 1/σ and plotted versus the change in amplitude of the excitatory synaptic conductance in models with γ of 680 fS (black diamonds) and 6.8 pS (blue circles). For comparison, a model with deterministic Ih and stochastic Na+ channels with γNa = 10 pS is shown (open circles). F, Input–output relationship showing the probability of AP generation versus the change in amplitude of the excitatory synaptic conductance in models with γ = 680 fS (black line; steepness of the sigmoid fit, s = 0.31 nS) and γ = 6.8 pS (blue line; s = 0.68 nS). For comparison, a model with deterministic Ih and stochastic Na+ channels with γNa = 10 pS is shown (open circles; s = 0.59 nS). Can the detection of subthreshold periodic signals, however, be facilitated by membrane noise via stochastic resonance (Wiesenfeld et al., 1994; Wiesenfeld and Moss, 1995; Stacey and Durand, 2000)? To examine the impact of Ih channel noise on stochastic resonance, the amplitude of DC injected into the soma was adjusted so that small sinusoidal currents (3 Hz; 4 pA peak-to-peak) were just subthreshold in models with deterministic Ih. In models with stochastic Ih, these current injections elicited stochastic resonance, with the SNR dependent on the amplitude of the Ih single-channel conductance, γ (Fig. 7C). In the example shown in Figure 7C (red circles), the SNR peaked in Ih models in which γ was ∼10 pS. According to classical stochastic resonance theory (Wiesenfeld and Moss, 1995), the SNR peak is expected at half of the threshold barrier height (ΔU). Consistent with this expectation, reducing ΔU by using larger DCs, which brings subthreshold sinusoidal currents closer to AP threshold, led to SNR peaks at smaller values of γ (e.g., <1 pS; data not shown). Decreasing the amplitude of sinusoidal currents from 4 to 1 pA with identical values of ΔU resulted in SNR peaks at approximately the same value of γ but smaller SNR amplitude. These findings indicate that, although detection of small periodic signals can be improved by voltage noise from stochastic gating of Ih channels, the optimal Ih single-channel conductance critically depends on the characteristics of the signal that is to be detected. We also investigated the impact of Ih channel noise on AP output during EPSPs of varying amplitude located 400 μm from the soma (Fig. 7D–F). For all EPSP amplitudes, ∼25 trials were repeated while changing only the values for the random number generator used to generate stochastic gating of simulated Ih channels. In models with γ of 680 fS, the variance in spike timing was small (σt ≤ 1 ms), and the precision (1/σt) increased linearly with synaptic strength (Fig. 7E, black diamonds). In comparison, considerable more jittering in AP latency was observed in models with γ of 6.8 pS, and precision increased only weakly with EPSP amplitude (Fig. 7E, blue circles). Simulations with stochastic Na+ channels, but deterministic Ih channels, indicated that stochastic gating of Na+ channels introduces similar reductions in temporal precision to that seen in models with stochastic Ih with γ of 6.8 pS (Fig. 7E, open circles). The reduced precision of AP generation in models with larger Ih channel noise was associated with a shallower slope of the input–output relationship of EPSP amplitude versus the probability of AP generation (Fig. 7F). A change in slope of this input–output function indicates that models with higher Ih single-channel conductance have a larger threshold uncertainty (White et al., 2000). Simulations with stochastic Na+ channels but deterministic Ih channels also showed a larger threshold uncertainty (Fig. 7F, open circles). Note that the change in the input–output function during EPSPs in models with stochastic Ih did not translate into a change in slope of the AP firing frequency (f) versus input current (I) relationship (f/I curve) during long (1 s) pulses (data not shown). This was presumably the case because the level of background noise generated by stochastic gating of Ih (SD < 1 mV) was too small to cause a change in f/I gain, as observed by others during balanced synaptic noise (Chance et al., 2002). Using NSFA of native Ih currents combined with simulations of their biophysical properties, we provide, to our knowledge, the first estimation of the single-channel properties of Ih channels in the brain in situ. To explore the precision of NSFA, we analyzed simulated Ih currents with predetermined single-channel properties and studied the impact of filtering, indicating a high stability of the extracted single-channel parameters, as well as little if any channel flicker. Indeed, the observed unitary conductance of Ih of 680 fS is in good agreement with the previous estimate of 980 fS for If in the sinoatrial node of the heart (DiFrancesco, 1986). We go on to show both experimentally and in simulations that stochastic openings of Ih generate voltage noise, which impacts on the fidelity of action potential output. Although our data provide compelling evidence for small-conducting Ih channels, a recent study in acutely dissociated CA1 pyramidal neurons using excised patches from the soma has proposed a >10-fold higher single-channel conductance of 10 pS (Simeone et al., 2005). Such large single-channel openings (∼1 pA), however, were not observed in previous cell-attached studies of native Ih currents in CA1 pyramidal neurons (Magee, 1998). In addition, it is also unclear how Ih currents were observed at all in the study of Simeone et al. (2005), given the evidence that Ih is very sensitive to enzymatic procedures for acute dissociation (Budde et al., 1994). Our findings in brain slices are also at odds with estimates of HCN single-channel conductance based on heterologously expressed HCN subunits (2.5–35 pS) (Johnson and Zagotta, 2005; Michels et al., 2005). Although the explanation for these discrepancies are also unclear, a number of proteins are known to interact with HCN subunits, such as Filamin A or TRIP8b (Gravante et al., 2004; Santoro et al., 2004). Additional experiments will be needed to address whether interaction of these proteins with HCN channels leads to modification of channel properties, such as single-channel conductance. Given this possibility, it is worth noting that the studies that used cell-attached recording configuration (the present study) (DiFrancesco, 1986) consistently observed a small single-channel conductance <1 pS. This may suggest that excised patch-clamp recordings disturb the single-channel properties of Ih, perhaps via removal of accessory or loss of interactions between HCN channels and critical cytosolic proteins. Given the wide spectrum of observed unitary conductances for voltage-dependent channels (from ∼1 to 300 pS) (Hille, 2001), we asked why is the single-channel conductance of Ih so small? A growing number of studies indicate that noise generated by random channel opening limits neuronal response reliability (Schneidman et al., 1998; White et al., 2000), influences the energy efficiency of channels (Schreiber et al., 2002), and constrains the physical dimensions of axon diameters (Faisal et al., 2005). Conversely, noise can have a beneficial role by enhancing the detection of weak periodic signals via a stochastic resonance mechanism (Wiesenfeld and Moss, 1995) or via enhancing subthreshold oscillations (Dorval and White, 2005). Based on these studies, it seems likely that the magnitude of channel noise is under evolutionary pressure in biological systems seeking energy-efficient coding systems (Laughlin and Sejnowski, 2003). We show here that native Ih channels generate between ∼40 and 130 μV of voltage noise (rms) spatially distributed from the soma to distal dendrites, with most of the power below 10 Hz (Figs. 5, 6). Although most recent studies have focused on the role of stochastic openings of Na+ channels (Schneidman et al., 1998; Diba et al., 2004; Dorval and White, 2005; Faisal et al., 2005; Jacobson et al., 2005), we propose that Ih is also likely to be an important source of intrinsic channel noise in neurons. This would be expected to be the case for a number of reasons. First, channel noise is greater for voltage-dependent channels, like Ih, that have slow activation kinetics (Diba et al., 2004). Second, channel noise increases linearly with channel number (Diba et al., 2004), and, as we show, Ih channel densities can be very high, particularly at distal dendritic locations (Fig. 4). Third, channel noise would be expected to lead to larger voltage noise in smaller compartments in which Ih channel densities are maximal. Finally, the depolarizing gradient generated by Ih will enhance Na+ channel noise. These observations indicate that the dynamic interplay between Ih and Na+ channel noise will need to be considered in future studies investigating the impact of membrane noise in neuronal computation. We asked whether Ih noise is large enough to impact on AP output. This was shown to be the case both for perithreshold weak periodic stimuli and single EPSPs (Fig. 7). In models with high Ih single-channel conductance (6.8 pS), larger AP jitter and lower phase reliability were observed compared with models with the experimentally observed Ih single-channel conductance of 680 fS. In contrast to these negative aspects of Ih noise, models with stochastic Ih also showed stochastic resonance for very weak (1–4 pA) oscillatory inputs. 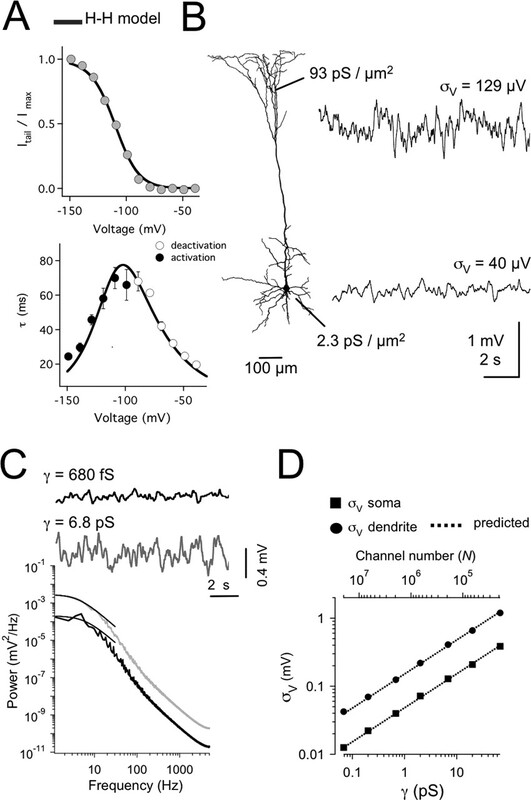 Whether such noise-enhanced signal detection is functionally relevant in cortical layer 5 pyramidal neurons is presently unclear, because, under in vivo conditions, it seems likely that voltage noise will be dominated by the large fluctuations of ongoing, spatially distributed, synaptic activity at dendritic sites (Destexhe et al., 2003). Furthermore, although Ih noise could improve detection of weak sinusoidal signals, the optimal single-channel conductance was critically dependent on the characteristics of the input signal to be detected. Thus, it seems unlikely that stochastic resonance mechanisms have worked as a selection factor for Ih single-channel conductance. Rather, our results suggest that such selection, favoring small-conducting Ih channels, is more likely to depend on the influence of stochastic channel noise on the reliability of spike timing (Fig. 7C, top, E, F). Although our studies concentrate on cortical layer 5 pyramidal neurons, which express Ih channels primarily in their dendrites, many of the results can be generalized in other neuronal and cell types. For example, expression of Ih in small-diameter compartments such as axons (Notomi and Shigemoto, 2004) would be expected to increase channel noise and limit the axonal conduction reliability (Faisal et al., 2005). 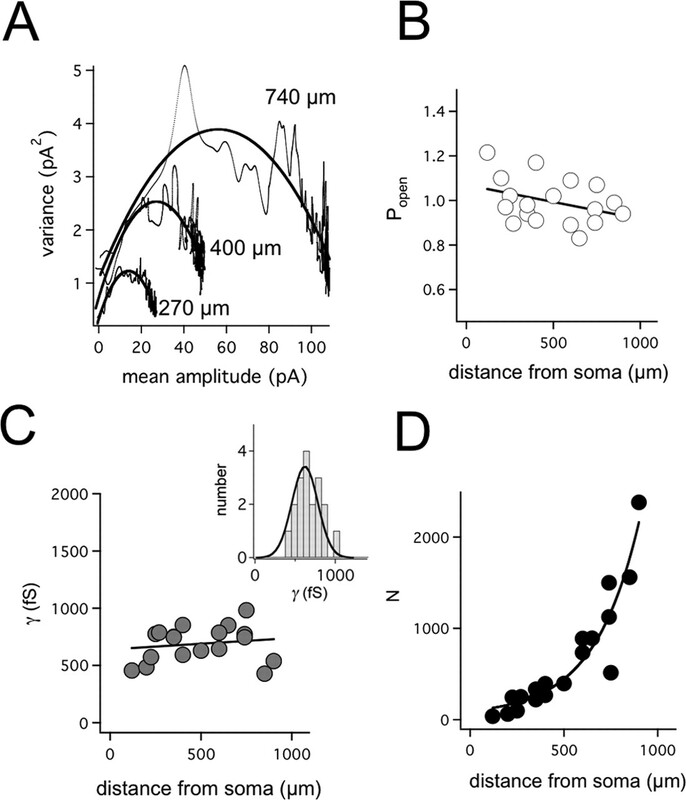 In addition, because the magnitude of channel noise is further increased by slower channel activation kinetics (Diba et al., 2004), it seems likely that spike-time jitter will be even greater in cells in which HCN activation is slower, such as in the cardiac cells (DiFrancesco, 1984) and thalamic relay neurons (McCormick and Pape, 1990). Such predictions remain to be tested. Given that theoretical relationships indicate that current noise is linearly dependent on single-channel number but changes with the square root of channel conductance (White et al., 2000; Diba et al., 2004), reducing single-channel conductance is an efficient means to reduce membrane noise attributable to stochastic channel gating. This result may well explain the small single-channel conductance of Ih channels in the brain and suggests that the single-channel conductance of Ih is evolutionarily constrained to be small to reduce its impact on both membrane noise and AP output. In conclusion, our results indicate that native Ih channels in the brain have a small single-channel conductance, comparable in size with the single-channel conductance of If in the heart, which is likely to be critical for reducing membrane noise attributable to stochastic gating, thereby maintaining the fidelity of temporal patterns of AP output. This work was supported by the Alexander von Humboldt Foundation (G.J.S.) and the Förderkreis of the German Primate Center (Göttingen, Germany) (M.H.P.K.). We are grateful to M. Heckmann for critical reading of previous versions of this manuscript. ↵*M.H.P.K. and S.H. contributed equally to this work. Alvarez O, Gonzalez C, Latorre R (2002) Counting channels: a tutorial guide on ion channel fluctuation analysis. Adv Physiol Educ 26:327–341. Berger T, Larkum ME, Luscher H-R (2001) High Ih channel density in the distal apical dendrite of layer V pyramidal cells increases bidirectional attenuation of EPSPs. J Neurophysiol 85:855–868. Biel M, Schneider A, Wahl C (2002) Cardiac HCN channels: structure, function, and modulation. Trends Cardiovasc Med 12:206–212. BoSmith RE, Briggs I, Sturgess NC (1993) Inhibitory actions of ZENECA ZD7288 on whole-cell hyperpolarization activated inward current (If) in guinea-pig dissociated sinoatrial node cells. Br J Pharmacol 110:343–349. Brown HF, DiFrancesco D, Noble SJ (1979) How does adrenaline accelerate the heart? Nature 280:235–236. Budde T, White JA, Kay AR (1994) Hyperpolarization-activated Na+-K+ current (Ih) in neocortical neurons is blocked by external proteolysis and internal TEA. J Neurophysiol 72:2737–2742. Chance FS, Abbott LF, Reyes AD (2002) Gain modulation from background synaptic input. Neuron 35:773–782. Colquhoun D, Hatton CJ, Hawkes AG (2003) The quality of maximum likelihood estimates of ion channel rate constants. J Physiol (Lond) 547:699–728. Conti F, Neumcke B, Nonner W, Stämpfli R (1980) Conductance fluctuations from the inactivation process of sodium channels in myelinated nerve fibres. J Physiol (Lond) 308:217–239. DeFelice LJ (1981) In: Introduction to membrane noise New York: Plenum. Destexhe A, Rudolph M, Pare D (2003) The high-conductance state of neocortical neurons in vivo. Nat Rev Neurosci 4:739–751. Diba K, Lester HA, Koch C (2004) Intrinsic noise in cultured hippocampal neurons: experiment and modeling. J Neurosci 24:9723–9733. DiFrancesco D (1984) Characterization of the pace-maker current kinetics in calf Purkinje fibres. J Physiol (Lond) 348:341–367. DiFrancesco D (1986) Characterization of single pacemaker channels in cardiac sino-atrial node cells. Nature 324:470–473. 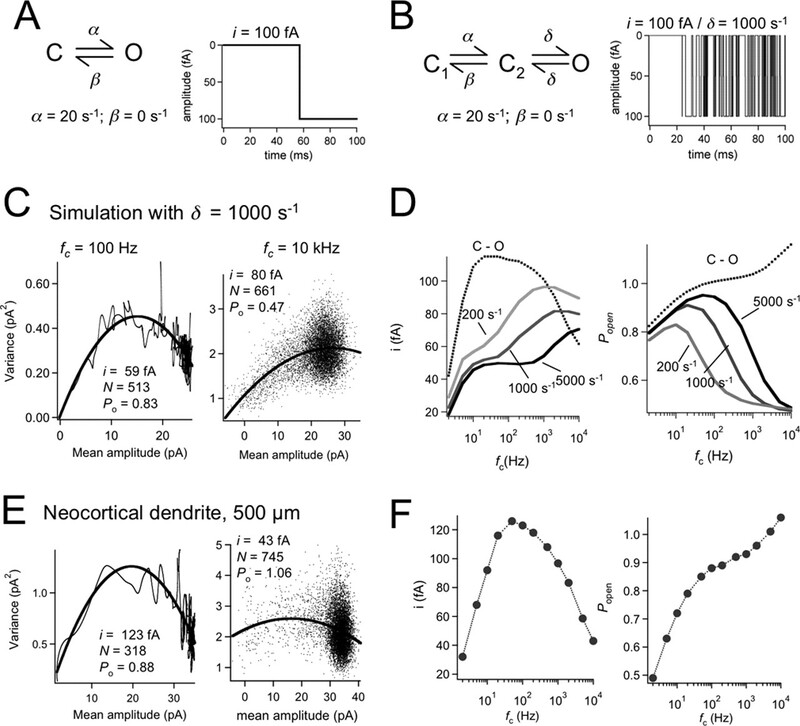 Dorval AD Jr, White JA (2005) Channel noise is essential for perithreshold oscillations in entorhinal stellate neurons. J Neurosci 25:10025–10028. Engel D, Jonas P (2005) Presynaptic action potential amplification by voltage-gated Na+ channels in hippocampal mossy fiber boutons. Neuron 45:405–417. Faisal AA, White JA, Laughlin SB (2005) Ion-channel noise places limits on the miniaturization of the brain’s wiring. Curr Biol 15:1143–1149. Gravante B, Barbuti A, Milanesi R, Zappi I, Viscomi C, DiFrancesco D (2004) Interaction of the pacemaker channel HCN1 with filamin A. J Biol Chem 279:43847–43853. Gulledge AT, Stuart GJ (2003) Excitatory actions of GABA in the cortex. Neuron 37:299–309. Halliwell JV, Adams PR (1982) Voltage-clamp analysis of muscarinic excitation in hippocampal neurons. Brain Res 250:71–92. Häusser M, Roth A (1997) Estimating the time course of the excitatory synaptic conductance in neocortical pyramidal cells using a novel voltage jump method. J Neurosci 17:7606–7625. Hestrin S (1987) The properties and function of inward rectification in rod photoreceptors of the tiger salamander. J Physiol (Lond) 390:319–333. Hille B (1978) Ionic channels in excitable membranes. Current problems and biophysical approaches. Biophys J 22:283–294. Hille B (2001) In: Ion channels of excitable membranes Ed 3 Sunderland, MA: Sinauer. Hines ML, Carnevale NT (2000) Expanding NEURON’s repertoire of mechanisms with NMODL. Neural Comput 12:995–1007. Hodgkin AL, Huxley AF (1952) A quantitative description of membrane current and its application to conduction and excitation in nerve. J Physiol (Lond) 117:500–544. Jacobson GA, Diba K, Yaron-Jakoubovitch A, Oz Y, Koch C, Segev I, Yarom Y (2005) Subthreshold voltage noise of rat neocortical pyramidal neurones. J Physiol (Lond) 564:145–160. Johnson JP Jr, Zagotta WN (2005) The carboxyl-terminal region of cyclic nucleotide-modulated channels is a gating ring, not a permeation path. Proc Natl Acad Sci USA 102:2742–2747. Laughlin SB, Sejnowski TJ (2003) Communication in neuronal networks. Science 301:1870–1874. Lorincz A, Notomi T, Tamas G, Shigemoto R, Nusser Z (2002) Polarized and compartment-dependent distribution of HCN1 in pyramidal cell dendrites. Nat Neurosci 5:1185–1193. Ludwig A, Zong X, Jeglitsch M, Hofmann F, Biel M (1998) A family of hyperpolarization-activated mammalian cation channels. Nature 393:587–591. Magee JC (1998) Dendritic hyperpolarization-activated currents modify the integrative properties of hippocampal CA1 pyramidal neurons. J Neurosci 18:7613–7624. McCormick DA, Pape HC (1990) Properties of a hyperpolarization-activated cation current and its role in rhythmic oscillation in thalamic relay neurones. J Physiol (Lond) 431:291–318. Michels G, Er F, Khan I, Südkamp M, Herzig S, Hoppe UC (2005) Single-channel properties support a potential contribution of hyperpolarization-activated cyclic nucleotide-gated channels and If to cardiac arrhythmias. Circulation 111:399–404. Notomi T, Shigemoto R (2004) Immunohistochemical localization of Ih channel subunits, HCN1–4, in the rat brain. J Comp Neurol 471:241–276. Press WH (2002) In: Numerical recipes in C++: the art of scientific computing Ed 2 Cambridge, UK: Cambridge UP. Robinson RB, Siegelbaum SA (2003) Hyperpolarization-activated cation currents: from molecules to physiological function. Annu Rev Physiol 65:453–480. Santoro B, Tibbs GR (1999) The HCN gene family: molecular basis of the hyperpolarization-activated pacemaker channels. Ann NY Acad Sci 868:741–764. Santoro B, Liu DT, Yao H, Bartsch D, Kandel ER, Siegelbaum SA, Tibbs GR (1998) Identification of a gene encoding a hyperpolarization-activated pacemaker channel of brain. Cell 93:717–729. Santoro B, Wainger BJ, Siegelbaum SA (2004) Regulation of HCN channel surface expression by a novel C-terminal protein–protein interaction. J Neurosci 24:10750–10762. Schaefer AT, Larkum ME, Sakmann B, Roth A (2003) Coincidence detection in pyramidal neurons is tuned by their dendritic branching pattern. J Neurophysiol 89:3143–3154. Schneidman E, Freedman B, Segev I (1998) Ion channel stochasticity may be critical in determining the reliability and precision of spike timing. Neural Comput 10:1679–1703. Schreiber S, Machens CK, Herz AV, Laughlin SB (2002) Energy-efficient coding with discrete stochastic events. Neural Comput 14:1323–1346. Sigworth FJ (1980) The variance of sodium current fluctuations at the node of Ranvier. J Physiol (Lond) 307:97–129. 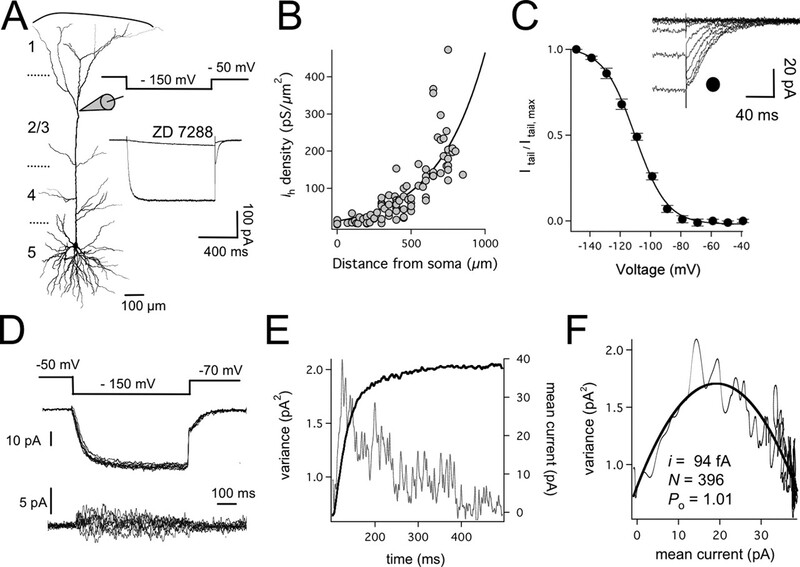 Simeone TA, Rho JM, Baram TZ (2005) Single channel properties of hyperpolarization-activated cation currents in acutely dissociated rat hippocampal neurons. J Physiol (Lond) 568:371–380. Stacey WC, Durand DM (2000) Stochastic resonance improves signal detection in hippocampal CA1 neurons. J Neurophysiol 83:1394–1402. Stuart G, Spruston N (1998) Determinants of voltage attenuation in neocortical pyramidal neuron dendrites. J Neurosci 18:3501–3510. Stuart GJ, Sakmann B (1994) Active propagation of somatic action potentials into neocortical pyramidal cell dendrites. Nature 367:69–72. Wainger BJ, DeGennaro M, Santoro B, Siegelbaum SA, Tibbs GR (2001) Molecular mechanism of cAMP modulation of HCN pacemaker channels. Nature 411:805–810. White JA, Rubinstein JT, Kay AR (2000) Channel noise in neurons. Trends Neurosci 23:131–137. Wiesenfeld K, Moss F (1995) Stochastic resonance and the benefits of noise: from ice ages to crayfish and SQUIDs. Nature 373:33–36. Wiesenfeld K, Pierson D, Pantazelou E, Dames C, Moss F (1994) Stochastic resonance on a circle. Phys Rev Lett 72:2125–2129. Williams SR, Stuart GJ (2000) Site independence of EPSP time course is mediated by dendritic Ih in neocortical pyramidal neurons. J Neurophysiol 83:3177–3182. Williams SR, Stuart GJ (2003) Voltage- and site-dependent control of the somatic impact of dendritic IPSPs. J Neurosci 23:7358–7367. Zagotta WN, Olivier NB, Black KD, Young EC, Olson R, Gouaux E (2003) Structural basis for modulation and agonist specificity of HCN pacemaker channels. Nature 425:200–205.